Carla, Carla, Carla: The Lost Chords. London Jazz Festival, November 2009. I think I shall have to come clean right up front. 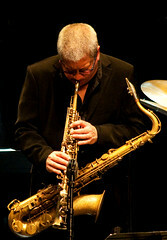 This was my gig of the London Jazz Festival. I hadn’t expected it to be – I thought it would be good, and I like Carla Bley’s, Steve Swallow’s and Andy Sheppard’s playing – but I didn’t think it would be that good. And then better still. So now I have to justify this: just what was it that made it so good? I think it was because Bley, Swallow and Sheppard – who with drummer Billy Drummod make up the Lost Chords (great name, great band…) – were all playing at the top of their game, and seemed to understand each other perfectly. Bley, Swallow and Sheppard have been playing together as a trio for many years – the lovely album “Songs With Legs” dates from the early 1990s – and this quartet has been playing together for five years or so. They seem to have developed a creative intuition, the whole very much greater than the sum. In the pre-concert talk, Bley said that she didn’t think much of herself as a pianist. She did herself a disservice: she was excellent throughout this concert. Her playing is very understated: several times during the set, I was reminded of Thelonious Monk’s playing. The Lost Chords opened with a long, almost-suite based on (believe it or not) Three Blind Mice – but that that’s three blind mice as if imagined by Monk. Bley makes every space and pause count. Later on, the band played an arrangement of Monk’s Mysterioso, where Bley had laid her own tune over the basic melody, producing a wholly new composition. It was the first time in a long while that I had heard Andy Sheppard – indeed, I think the last time must have been with Bley and Swallow about ten years ago in Edinburgh. His playing was a revelation: his playing has great confidence. He plays with a very clean tone; Bley said earlier that she first worked with Sheppard because she wanted a saxophonist who didn’t try to sound like Coltrane, and whilst he must have been influenced by Coltrane, he has very much his own sound. He played tenor and soprano – he played lots of very long notes on soprano (circular breathing, I’d guess) when other sax players would have seen how many different notes they could squeeze. Sheppard’s minimalist approach was perfectly in keeping with Bley’s piano. Swallow is another of Bley’s long-time collaborators. His electric bass playing was very fluid and melodic, becoming a third lead instrument and duetting with Sheppard. Drummond did exactly what he needed to, sometimes being subtly sensitive, others energetic and driving. There was another feeling I got throughout the concert: I kept hearing echos of Gil Evans. This surprised me, since Evans’ arrangements for big bands are on a very different scale to the Lost Chords quartet. But Bley has done much of her composing for many big bands – her own, Charlie Haden’s Liberation Music Orchestra, way back to George Russell’s orchestra nearly 50 years ago. Seeing her big band play Hackney Empire in the early 1990s (I think this was an edition of her band called the Very Big Carla Bley Band), I recall she said that the arrangement of Goodbye Pork Pie Hat was borrowed from Evans. Swallow co-produced and played on John Scofield’s beautiful album Quiet, and Scofield’s horn arrangements on that always make me think of Gil Evans, too. Joining things up, Sheppard played in Evans’ European touring bands. This concert was a joy from start to finish, the first finish being another short suite, Lost Chords, the second being a beautiful, slow and mournful encore Útviklingssang. Throughout the concert the music had depth, emotion and delicacy. It was simply gorgeous. 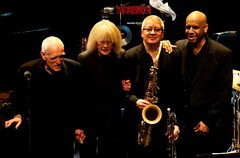 This entry was posted in Jazz and tagged Andy Sheppard, Billy Drummond, Carla Bley, LJF, Lost Chords, Queen Elizabeth Hall, Steve Swallow on November 21, 2009 by patrickhadfield.